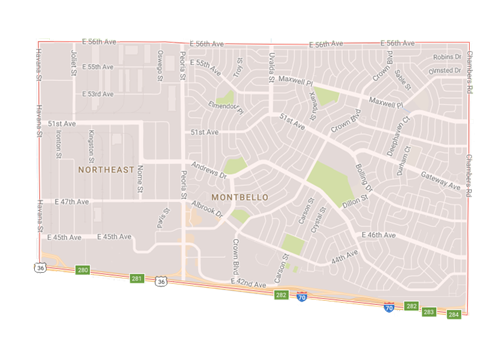 The Montbello neighborhood began as a suburban-style development in the northeastern section of Denver county. In Montbello, home buyers can find a mix of single family homes and new construction. Montbello also boasts easy access to the Rocky Mountain Arsenal Complex, a National Wildlife Refuge that offers over 15,000 acres of prairie, wetland, and woodland habitat. Recently, Montbello was recognized as one of the hottest suburban housing markets not only in Colorado, but in the entire country by the Denver Post. It’s one of the few areas in Denver where new single-family construction is available and remains more affordable than in other neighborhoods in the Denver metro area. There are several schools in Montbello, including Montbello High School, six elementary schools, one K-8, and a middle school. Many popular restaurants and shops are just a short drive away in Northfield. Public transportation on the light rail is easily accessible.